Q: What are the core practice areas of BOC? A: Commercial Law Practice, Litigation , Arbitration and ADR. Q: When was BOC established? Q: How many offices has BOC currently? A: Three offices, including the head office in Abuja and branch offices in Lagos and Ilorin. Q: How many partners make up Bayo Ojo? A: Four specialised partners including two Senior Advocates of Nigeria , in the mean time. 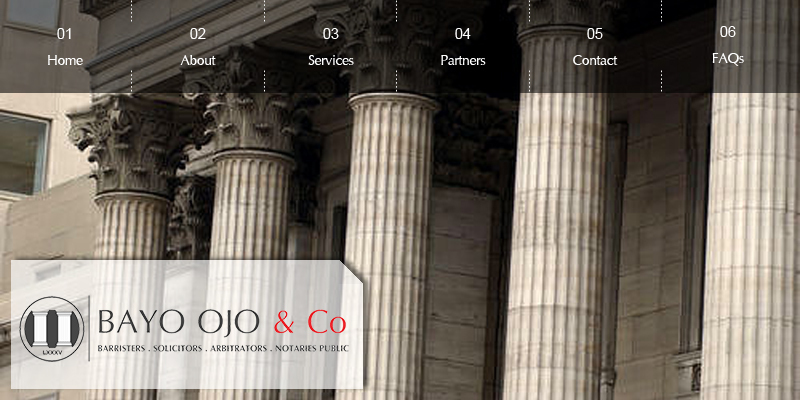 Q: Where does BOC as one of the prominent Law Offices in Nigeria rank? A: It ranks as the first class by clientele, position, geographical location, standard and achievement. Q: When is the official working hours of BOC? A: 8-5pm,Monday-Friday. However, its members of staff are always at the best service of the clients. Q: What is the vision statement of BOC? A: To infuse decency, innovation and best practice into the profession. Q: Does BOC admit Law Attachment Students? Q: Is BOC registered with NYSC? A: No, but accommodates a limited number of Youth Corpers. Q: How can one initiate a job search in BOC? A: By forwarding his/her CV to our e-mail address. Q: Where does one find BOC offices?